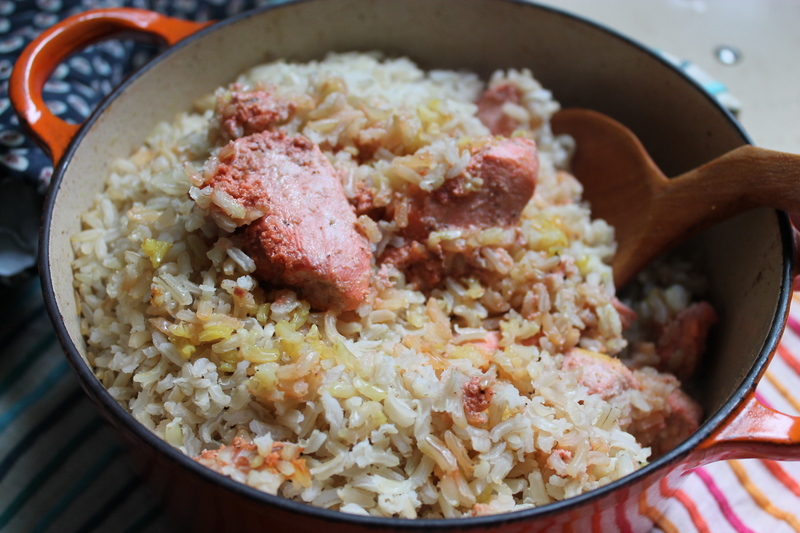 We’re a big fan of rice dishes, especially when the temperature drops as it has this week in London. Jollof rice, kabsa, egg fried rice, bibimbap, jambalaya, kitchadi, paella, pulao and risotto – we love them all! 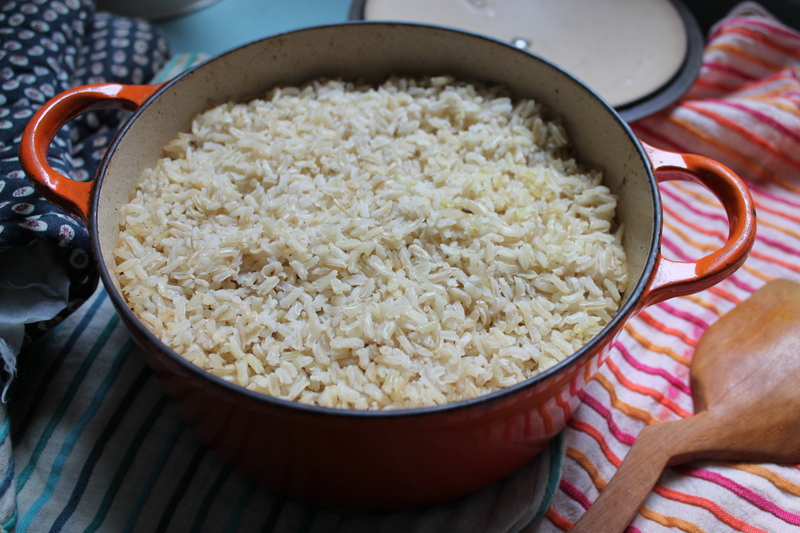 So we decided to show you another one of our favorite rice dishes: biryani. If you’ve ever attended to an Indian wedding or celebration, the odds are that you’ve tried some form of biryani. Most biryanis you encounter are white basmati rice-based and made using lamb/mutton, chicken, fish or beef. This is a feasting dish and so the story goes, fit for Indian royalty – who used to challenge their chefs to prepare the ultimate biryani dish using a variety of different meats, vegetables, dried fruits, nuts and spices. (A challenge not unlike our beloved Great British Bake-off!) It makes sense therefore that this typically isn’t an everyday dish – it’s a lovely, buttery, spiced meat-carb extravaganza and, well, it’s a bit of a faff. But don’t worry, we’ve got you covered. Luckily this is a technically simple dish and we’ve adapted it for everyday, home cooking so that it’s much simpler. We’ve used the semi-kacchi method which means we’ve partially cooked the meat and rice separately and then layered them in a cast iron pan and steam-cooked the mixture in an oven. 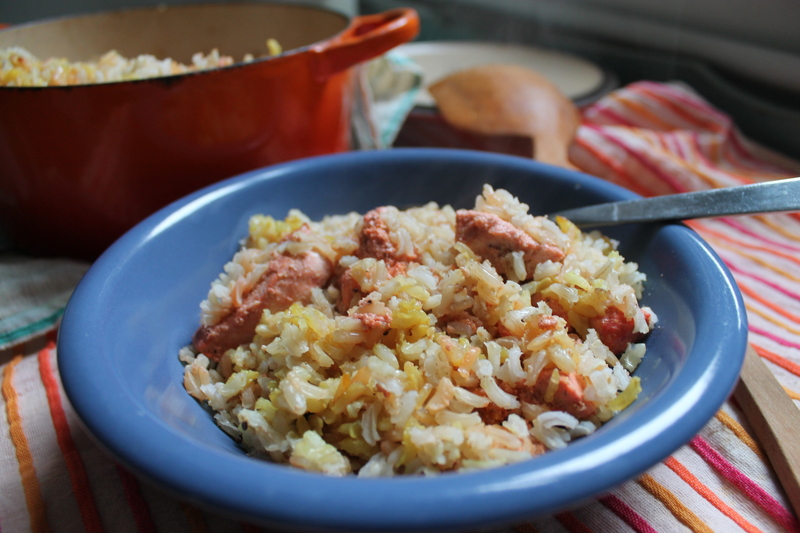 The result is perfectly cooked rice and tender chicken – a complete meal! We’ve used this method because it means the meat and rice are totally integrated and the rice takes on the flavour of the meat. Biryanis also tend to be a bit oily and heavily spiced but apart from the light frying of the chicken and a bit of ghee here and there, our version is pretty – dare we say it – healthy. So you’ll find that it’s a lot lighter than your typical biryani. But still super yummy! Wash the chicken pieces and marinate them with tandoori powder, garlic, ginger, yoghurt, salt and pepper. Refrigerate for 30 minutes. Meanwhile, wash the rice 3 times (even rice bought in the West can contain insects – gross. And why 3? We have no idea. But our mother does it and so should you!). Boil the rice for 15 minutes until halfway cooked. Drain and set aside. Take the chicken out of the fridge and lightly fry in about 1/2 tsp oil until the outsides of the chicken pieces are seared but not cooked through. Set aside on some kitchen paper. Preheat the oven to 170C (fan-assisted). In an ovenproof dish (as you see, we love our Le Creuset), heat 1 tsp of ghee and then fry cumin, cardamom, cloves, bay leaf and turmeric very lightly. Take off the heat and mix in another tsp of ghee. Finally, add a couple of tbsp of water on top. (This is so the whole mixture steam-cooks properly.) Place a tea towel you’re not a fan of (you’ll find out why later*) over the top of the rice (again, to help steam the mixture) and place the lid over it. Place the pan in the oven for 30 minutes. Open the lid when you’re ready to eat, grab and big spoon and give everything a good mix, so that you can experience all of the layers! Eat with plain yoghurt (and maybe some Indian pickle if you’re so inclined) and feel like (semi-)royalty. *The tea towel came out a bit, er, singed. You can skip this step if you have a tight-fitting lid.